Prime Deception was a great change of pace for me. It's an adult suspense novel, something I don't read very often. The premise alone was very intriguing: Lorna Thomas is in love with Britain's Deputy Prime Minister---who is married. They have an affair, break up, and then Lorna is found dead of an apparent suicide. Lorna's identical twin, Laurie, believes Lorna was murdered, and sets out to find her killer. Laurie goes so far as to get Lorna's old job as an intern with the Deputy Prime Minister's office, to get close to the man Lorna loved. Her arrival has the Deputy Prime Minister, Charles, thinking he's going mad, that he's seeing Lorna's ghost (he never knew she had a twin). Soon, the two team up to discover the truth about what really happened to Lorna. Prime Deception is written with a dual narrative. I liked that because Jones really let the reader into both Laurie and Charles's thoughts. The setting of London was fun for me, and made the story more interesting. There was great character development, which was a definite plus given how long this book is. And to top it all off, there was a ton of suspense. Jones kept me guessing until the end as to what really happened the night Lorna died. I found myself really invested in the story, and quite surprised at the ending. Speaking of the ending, I loved that it was realistic and true to the story. It wasn't your typical YA fairytale ending, rather it was more of a "this is how it would happen in real life" ending. 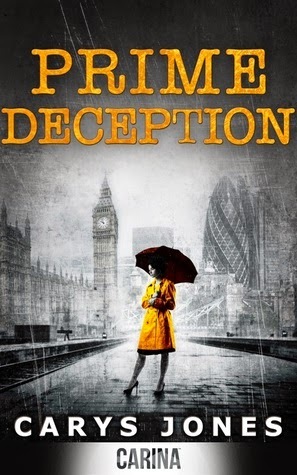 My two complaints about Prime Deception was that the story was quite heavy on the emotions of both main characters (I got a little tired of hearing just how much Charles missed Lorna) and that the pace was slow until the end of the book. There was a lot of build up, which was great, but it made for slow reading for much of the story. Part of this feeling could be that I'm used to the faster pace and quicker payoff of YA literature. All in all, I finished Prime Deception happy that I'd taken the time to read this book. It was a neat read, and worth your time if you like suspense novels. I really enjoyed it and would definitely read Carys Jones again.